School holidays or not, August can be a depressing month. There is that hollow moment when the football season starts again, and Saturday evenings have that feeling of autumnal darkness creeping in. Tonight, walking home, the faint chill spoke more of September than summer. With darker nights no author comes more to mind than Susan Hill, master of the ghost story and some truly terrifying explorations of evil. I’ve blogged before about the superlative Woman in Black. Indeed, it was the play of the novel which first introduced me to – and then hooked me on – her writing. If you’ve survived the terror of The Woman in Black, try The Mist in the Mirror, an equally atmospheric gothic tale. More recently, Hill has started a series of crime novels featuring the detective Simon Serrailler. Set in the cathedral city of Lafferton, Hill creates a world of truly unexpected, disturbing wickedness. 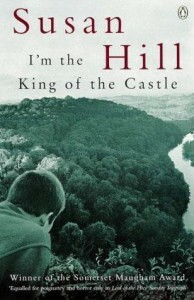 Hill’s ability to explore evil is best shown for me in I’m the King of the Castle. In its focus on the cruelty of children and its awareness of class, it shares much in common with Lord of the Flies. But where Golding’s tale is described by him as a myth, Hill’s novel is a much more realistic account, often seen through the eyes of the silently suffering Kingshaw, a small and timid boy. It’s this ability to write about emotions which makes her writing memorable and, for me, is its distinguishing feature; for as much as she writes about evil, her writing also sees the complexities of human relationships and often the winning power of love. In The Springtime of the Year, Hill’s first published novel, is a touching – but without any sentimentality – story of mourning, at one time recommended as reading on the subject of loss for trainee clergy, a theme she returns to frequently; Air and Angels (the title is an allusion to a John Donne poem) a story of love, frustration and ambition, set against a backdrop of Victorian England; A Kind Man a parable of love, duty and goodness. Although she’s been nominated for the Booker Prize, it’s hard to describe her as a particularly high-brow novelist. Rich in allusion, poetic in style and often insightful, her writing remains accessible; she’s written for children as well, including the Christmas prose-poem Can it be true? Indeed, with her career spanning over fifty years and more than twenty published novels, I can think few other writers today who have quite such a breadth to their output. Perhaps that’s recommendation enough.